Deep into the bowels of West 12 shopping centre in Shepherd’s Bush, a secret island paradise has appeared. One that’s perfect for wannabe buccaneers and rum-lovers alike. Welcome to The Lost Lagoon, an immersive theatrical experience that’ll get you ship-faced. 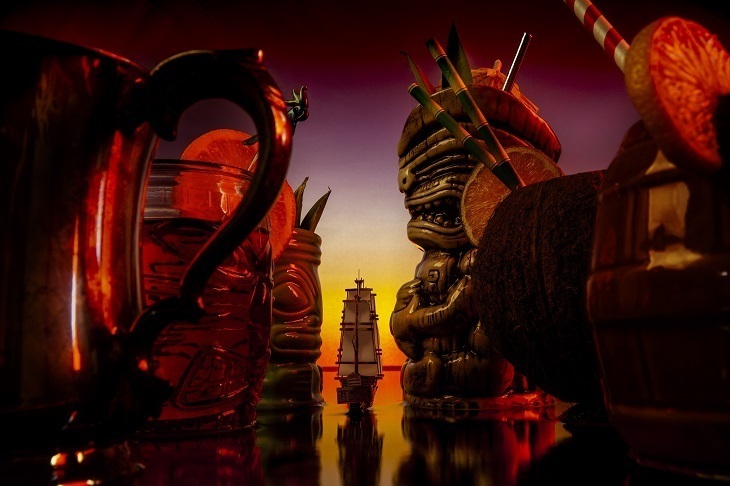 Noted ‘culinary anarchists’ Bompas & Parr and Captain Morgan rum have gone to some lengths to bring their nautical fantasy to life, including creating an actual lake measuring 4000 square feet. Intrepid explorers are invited to cross these uncharted waters by boat, in search of devilishly delicious drinks and the island home of none other than notorious 17th century privateer Captain Henry Morgan. It seems that, in between all of the plundering and torture, the admiral was a bit of a party animal — those who reach their destination will be rewarded with an epic, rum-soaked shin-dig. On the way, you’ll pass islands inspired by the atolls of the south-pacific where ‘cocktail-based escapades’ await. The organisers aren’t giving away too many details yet, but with Bompas & Parr — whose previous projects include gin clouds, non-melting ice-lollies, and giant pink mist waterfall — at the helm, it’s safe to say that you’re in for an utterly unique adventure.